Hoo Bears by Helen Oliver - Bears Available NOW! As at 10 May 2017, Marvin is looking for a new home! Marvin is an inquisitive sort of bear. He measures 45cm approximately from head to paw and is made from cinnamon coloured curly mohair. 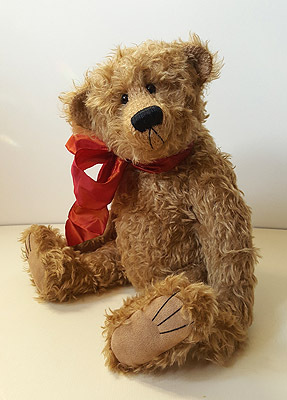 He has brown ultrasuede pawpads with claws, is fully-jointed and softly filled with a mixture of polyester and pellets, giving him a very cuddly feel. He wears a russet coloured taffeta ribbon tied in a large fussy bow around his neck. 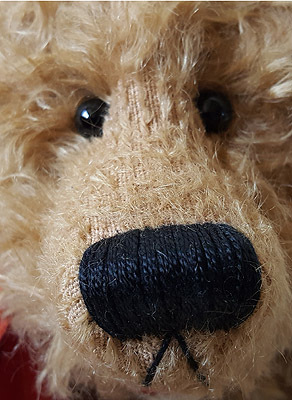 Marvin is a limited edition One-of-a-Kind bear. He is quite intelligent and enjoys the odd crossword puzzle (cryptic, obviously!). ADOPTION FEE: SORRY! - I've Been Adopted!! Jack is made from caramel coloured 100% cotton towelling pile fabric. He has light caramel coloured ultrasuede paw pads although one foot pad has been 'repaired' with a linen patch sewn around with over-size stitching. He is softly filled with a mixture of polyester and pellets and is wearing pale blue and red checked cotton dungarees with red braces. click me to see the bigger picture! Dolly is made from silvery-white long pile sparse mohair with mushroom coloured ultrasuede paw pads with black claws. She is softly filled with a mixture of polyester and pellets and wears a cerise-coloured knitted cardigan. She has a matching checked ribbon tied in a bow on tip of her head and a cerise butterfly is perched on her left foot. Gracie is made from charcoal grey long pile sparse mohair with dark grey ultrasuede paw pads. She is softly filled with a mixture of polyester and pellets. She wears an unbleached linen jacket with maroon blanket-stitched edges and 3 small maroon buttons. She also has a golden-yellow organza ribbon tied in a bow on top of her head. Orpheus is a panda made from chocolate-brown sparse mohair with an off-white body and head. 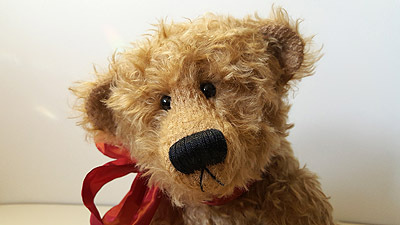 He has mohair paws with suede appliquéd pads, and his nose is embroidered with stripes of gold thread. He is softly filled with a mixture of polyester and pellets and wears a green and gold faded organza ribbon tied in a large fussy bow around his neck. Yoghurt is made from honey coloured sparse distressed mohair with champagne fabric paw pads. He is softly filled with a mixture of polyester and pellets and wears an off-white organza ribbon tied in a large fussy bow around his neck. He has a miniature carved wooden spoon hanging from a red leather cord around his neck. His arms are bent at the elbow as he tightly clutches his spoon, patiently awaiting his next pot of yoghurt. All sizes are approximate. All prices are stated in British Pounds (GBP). Colours may differ slightly from those shown in the photographs, due to the image reproduction process. Hoo Bears are intended for collectors. (e.g. all Hoo Bears have glass eyes and most contain small pellets of various materials, including lead, where indicated). Copyright © 2001, 2002, 2003, 2004, 2005 Hoo Bears. All Rights Reserved.